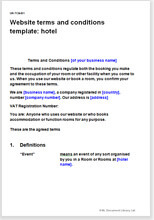 This terms and conditions template is suitable for a hotel that takes some bookings on its website. The hotel may offer other services in addition to rooms, such as venue hire, business meeting facilities, and leisure facilities (spa treatments, swimming pools, gyms). It can be customised easily to reflect how your business operates. Your terms and conditions are the contract between you and your guests. Unless you set out your terms clearly, you leave your business open to guests overstepping boundaries (such as check-in and check-out times) and to complaints that unrealistic service levels were not met. Of course, even the most well written T&C aren't going to prevent difficult customers finding something to grumble about, but they should protect you from more serious claims that you haven't provided the level of service that your guests expected. In the hotel and leisure industry many contractual terms are also part of the explanation of what is provided, and how and where and when (for example, what is included in the price of a room, or how a customer can cancel a reservation). 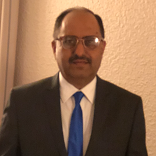 We have followed the industry practice of presenting the terms in a style that does to look like a legal document and that does not use legal jargon. The terms themselves have been written for placement on your website. We assume that your guests will read and accept them just before confirming a booking (or giving their card details, if you take this information online). They can equally be adapted for print. We sell another set of terms and conditions for hotels that don't offer additional services, and for bed and breakfast businesses. You may be interested to look at: Website terms and conditions template: bed and breakfast business. It would be impractical to set out the terms of each service in full detail in this document (such as use of the swimming pool). This document provides for the situation that you set out the rules of use of services in more detail in some other way (such as on notices around the hotel).